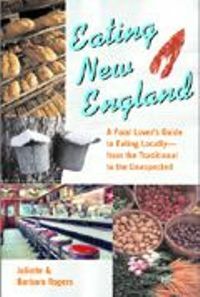 Eating New England, by Juliette Rogers & Barbara Radcliffe Rogers, 2002. "A Food Lover's Guide to Eating Locally." This unique guidebook highlights places across the region where you can enjoy traditional, ethnic and gourmet specialties. Includes farms, stores, bakeries, orchards, farmer's markets, breweries, wineries, ice cream shops and more. 356 pp.